If you stumbled upon this article, you were probably searching for some information on spy apps. In this article we are going to over a brief overview of what exactly spy apps are, what they are used for, how to tell if they are on your phone, and then take note of an undetectable spy app for android. Why Use a Spy App? Is there a Spy App on My Phone? “Spy App” is just a general term for a piece of software that goes on an electronic device and collects information without the user’s knowledge. In this specific instance we are going to focus on spy apps for Android phones. Spy apps are able to see your text messages, phone calls, GPS location, photos, app usage, and much more! This might sound like a complete invasion of privacy, but there are sometimes legitimate reasons why you would want to spy on someone else’s phone. A parent might be interested in their child’s cell phone usage and want to see if they are contacting anyone they shouldn’t be. A husband or wife could be curious of their partner’s late night text messages and need to know if there is something else going on. An employer might be suspicious of a certain employee giving away company secrets. You Lost/Let Someone Borrow Your Phone – Generally a spy app would be installed by someone who is close to you. In most instances, they need physical possession of the phone to install the software. So if you phone starts acting crazy after not in your possession, this could be a reason why. Data Usage Increases Dramatically – If you use data for your phone, it is generally around the same amount each month. If you notice a huge increase in data usage on your phone bill, there might be an app running unknowingly in the background all the time. Phone Acting Strangely – If your phone randomly shuts off and resets or gets really hot or you hear strange noises while on a phone call, this could be an indication of a spy app on you phone. If you notice any of the above on your phone, the first step would to open your application manager and Google any suspicious apps running. You should be able to see if they are legitimate or ways to uninstall them if they don’t belong there. 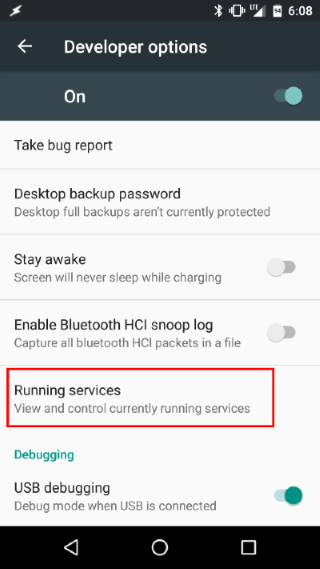 To see all the apps that are running on Android, it needs to be done under developer options, which needs to be enabled manually. If you are not technically savvy, you could do a factory reset of the phone. Note: You should backup your phone before trying this option because everything will be deleted. If you are someone who is looking to do the spying, TopTrackingApps.Com recommends mSpy as the best undetectable spy app for android. mSpy is a brand of mobile and computer parental control monitoring software for iOS, Android, Windows, and macOS. mSpy monitors and logs user activity on the client device. This software is marketed at parents as a way to monitor smartphone, tablet, and computer usage of their children. Parents can monitor a range of smartphone activities their kids are taking part in, from their child’s physical location to their browser history, video, images, emails, texts, and more (Wikipedia).